The Rodale Institute wrote up a great review of our new Greenhorns Guide for Beginning Farmers. or read on for the full text! Emblematic of the wonderfully tangible but somewhat invisible youth farming movement in the United States is a virtual communal writing project “by young farmers for young farmers.” At last count, The Greenhorns’ Guide for Beginning Farmers was 40 pages long and growing. It’s growing like a volunteer Cherokee Purple tomato plant on a steamy June morning: reaching inexorably onward, unstaked but not unmindful of soil, sun and its genetic destiny of leaf, blossom, fruit, seed and more and again. The downloadable document (available at www.thegreenhorns.net/reading.html) is the working draft of a field guide to existing resources, and the foundation for farmer contributions that will be combined into a book that will catalyze, inspire and empower young people (and others) who have an unquenchable passion to figure out how to become sustainable agriculturists in the post-capitalist, post-oil and post-commodity era. It’s to be “a cheerful resource for college-age entrants, as well as career-changers. It’s one part pep talk. One part institutional index. One part strategic /skillset field-guide,” according to its self-description. Don’t let the not-infrequent typos or inconsistencies between versions fool you: there is power in this collective non-organization that exists without a physical headquarters or formal structure. It is alive nonetheless. What it lacks in conventional attributes it more than compensates for in dynamic potential. Think of the difference between fertilizer and compost. The Greenhorns network is fermenting into its future around the determination of Severine von Tscharner Fleming and associated filmmakers, new food producers, agro-ecologists, food activists and urban farmers to make a film and now create a book that both explains what they are doing and helps others to come along. Most were not raised anywhere close to agriculture, and they are eager to find people who were and who want to talk about it. Amidst writing and looking for a publisher, von Tscharner Fleming was filming this week in Rhode Island at a speed-networking session for young farmers and potential buyers. Linking her to the state was Louella Hill, Rhode Island’s first artisanal cheese maker in a century. “Spontaneous and simultaneous cohort creation and networking is what we can contribute on our budget,” she says. Everyone involved is a volunteer, each with other lives, none able to be the “editing mule” to lock in on crafting the book in the midst of farming their farms and their learning-talking-relating network lives. They are eager-bordering-on-desperate to sponge up the vast and diverse areas of farming common sense they need to leap into the next growing season with more confidence. 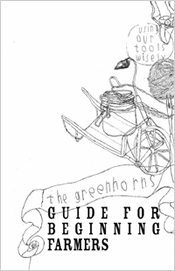 So how is it that the Greenhorns Guide has been included in food policy and environmental studies curricula by more than a dozen colleges and universities from Columbia to UC-Santa Cruz to University of North Carolina, Harvard, Yale and Middlebury? Simply because it speaks in a fresh way to the immediate questions that students want answered and that professors can’t do with traditional texts. Schools “have offered to pay, but I don’t feel right about accepting money for it yet,” von Tscharner Fleming said, offering another insight into her willingness to build on the growing commitments of people and institutions, even before she asks them to pay their way. “A lot of college kids really want to farm,” von Tscharner Fleming said, “People want to know how to take an activist stand for professional life. Our goal is to promote, recruit and support young farmers in America. “We provide the tools, inspiration, vision and comradeship to the young farming movement. Interest is increasing as the culture keeps moving through crisis of capitalism and people get hungrier,” she said. The guide covers apprenticeships and skills-development options before delving into the how-to: access to land, capitalization of diversified small operations, basic farming, marketing certifications, building community, do-it-yourself skills, resources and advocacy groups. The wiki site allows anyone to contribute insights, resources, experience and connections. Much good comes from the peer-group writing, but von Tscharner Fleming says the collaborators really want older farmers to share, too. Are you addicted to sunshine? be a friendly neighbor and helper in your community. Elements of permaculture, Ben Franklin, your farming grandparents, Van Jones, Robert Rodale, Wendell Berry, Chip Planck, Gandhi, Will Allen and the Nearings all emerge, re-mixed as an agro-ecological cultural renaissance wrapped in a cool buzz. Greg Bowman is Communications Manager at the Rodale Institute.